Fishing was steady once again over the last two weeks. The sheepshead bite has been very good, with most of the fish being over 12". Live shrimp fished on the bottom around submerged structure on the north side of Siesta Key worked well. Ladyfish were plentiful on the flats near Marina Jack and the Field Club. They hit Bass Assassin jigs and live shrimp. Spanish mackerel hit trolled spoons in the inshore Gulf of Mexico on days that the breeze let up. The sheepshead bite remains strong in both passes and surrounding docks and bridges. Live shrimp fished on the bottom worked best. Most of the fish were in the 2lb range, with some larger ones mixed in. Small Spanish mackerel hit Rapala plugs trolled and cast in the passes and inshore Gulf of Mexico. Ladyfish and the occasional Spanish mackerel and speckled trout hit jigs and shrimp on the deeper flats. We had perfect conditions on Tuesday and caught a half dozen king mackerel trolling spoons in the Gulf of Mexico just off off the inshore artificial reefs. Sheepshead were landed near structure in Big Sarasota Pass on the north end of Siesta Key by anglers using live and frozen shrimp. The artificial reefs in the inshore Gulf of Mexico produced some sheepshead and grunts as well. This has been the most consistent bite for the last few weeks. Also, there was also a lot of small bait in Robert’s Bay. This has attracted ladyfish and speckled trout. Clients caught them using jigs and live shrimp. Dolphins were aggressive and scared the fish away a couple days. Warmer weather has the water temperatures back up into the mid 60s and the fishing has improved. Jack crevalle are showing up in various locations south of Siesta Drive. Jigs and plugs worked well when cast to breaking fish. Snook and jacks are up in creeks and canals along with area rivers and hitting jigs and plugs. Sheepshead numbers are increasing daily and were found under docks and around structure throughout the area. Some nice mangrove snapper were mixed in as well. Live shrimp was the best bait. The best fishing for anglers the last couple of weeks was casting plugs and jigs in area creeks, canals, and rivers. Big jack crevalle and snook have moved up into these areas with the cooler weather. High tides in the afternoon were best. Also, sheepshead were caught under docks near both passes by clients using live shrimp. A few ladyfish hit jigs on the deeper flats. Fishing has been fair over the last two weeks. Fishing pressure was high due to the Christmas traffic and we are still rebounding from the red tide. Sheepshead showed up under docks and around structure near the passes. We caught them and mangrove snapper using live shrimp fished on the bottom. Big jacks were found on the flats and in the channel and hit plugs, jigs, and flies. Ladyfish were caught in deeper areas using jigs. Weather fronts have been moving through, bringing strong winds. In between the fronts, the fishing has been decent in Sarasota Bay. Sheepshead are fairly numerous under docks in Big Pass and Robert's Bay are hit shrimp. Ladyfish were found in slightly deeper water around 10' deep, especially close to grass flat edges. Snook have moved up into residential canals, creeks, and rivers. Rapals plugs fooled them. Jack crevelle were mixed in as well. Fishing was steady over the last two weeks in Sarasota. Jack crevelle provided good action, hitting Rapala plugs in Phillippi Creek. Sheepshead moved into the area, hitting live shrimp fished under docks in Robert's Bay and Little Sarasota Bay. Mangrove snapper were plentiful as well, though most were small. Ladyfish hit Bass Assassin jigs on the open flats on the high tide. Red tide still persists off of the beaches and north of Siesta Key. I ran both Myakka River charters and Sarasota Bay charters this week. Anglers casting Bass Assassin baits and Gulp! Shrimp on jig heads experienced fast action on ladyfish. With the persistent red tide, the area between Siesta Drive and Blackburn Point were the most consistent areas. A few speckled trout were caught as well. Pilchards fished under docks fooled jacks, snook, and snapper. Action in the Myakka River was fair this week. It got VERY warm by the end of the week, and that slowed the bite. Still, anglers casting Rapala plugs hooked a couple large snook and landed fish to 24″. The approaching cold front should improve the fishing. Snook fishing was very good this week in Sarasota! Clients on Sarasota fishing charters landed good numbers of fish to 35". Several very large fish were hooked and broke off. Most of the snook hit live pilchards. Redfish to 25", jack crevelle to 4 pounds, and mangrove snapper to 15" were also landed. Bait was plentiful on the flats. Anglers also did well first thing in the morning casting Rapala X-Raps around shoreline cover. Jacks, snook, snapper, trout, and ladyfish were caught on the plugs around bait schools. Bait is thick on the beache. River fishing trips produced some nice snook as well. Anglers casting Rapala X-Raps and BX Minnow plugs landed some decent fish and lost a couple big fish. Bass and jacks were caught along with the snook. River fishing is getting started, it will run until mid March or so. The red tide levels are the lowest that they have been for two months. Bait fish are showing up on the flats near the passes. Clients on Sarasota fishing charters did well fishing Robert's Bay and Little Sarasota Bay. Snook, jack crevelle, and mangrove snapper were caught under docks, around oyster bars, and at the mouths of creeks. Rapala plugs worked well early in the morning. As the sun came up, a switch to chumming with live pilchards proved to be the trick. We had our first cool front of the year move through. Hopefully, the fall run of Spanish mackerel and false albacore will get going soon. Unfortunately, red tide has shown up off of the Sarasota beaches. I hate to see the red tide affecting Sarasota fishing, but it does. Patient anglers can still caught fish, the key being finding "clean" water on Sarasota fishing charters. Some of my favorite spots near Big Sarasota Pass and New Pass had red time move into it during the middle of the week. It wasn't terrible and clients caught a few fish. However, the dead fish floating nearby kind of take way some of the enjoyment. The good news is that at least for now, the middle portion of Sarasota Bay has clean water and plenty of fish. On Friday morning we ran across a couple large schools of jack crevelle. They were terrorizing bait fish in three feet of water. We got on them several times with a couple double-headers. That bite slowed, so we eased out and worked grass flats in six feet to seven feet of water at Bishop's Pt., Buttonwood, and Stephen's Pt. Action was steady with numerous speckled trout to 18" being landed. Jigs with Bass Assassin baits, Gulp Shrimp, and live shrimp were all effective. Bluefish, mangrove snapper, gag grouper, ladyfish, jacks, and catfish were also caught. While anglers can achieve success during periods of red tide, tactics do need to change. Fishing with live bait fish can be difficult. Red tide will move bait fish schools and it can be difficult to keep bait alive. Running through one little patch can kill them all. Live shrimp are not affected, it seems. Anglers will do well by fishing fast and moving around until fish, and good water, are located. Artificial lures such as the jig and grub combo work well. Jigs allow anglers to cover a lot of water fairly quickly. I wish my Sarasota fishing report did not include red tide affecting Sarasota fishing. More info at the FWC site. Snapper and trout top the list of species landed by clients this week. My Sarasota fishing report features those species along with many others that hit live and artificial baits in Sarasota Bay. Anglers did well on Sarasota fishing charters of late. Speckled trout and mangrove snapper were the top catches. Spanish mackerel, bluefish, flounder, sea bass, grouper, ladyfish, jacks, catfish, and were were also landed. Gulp Shrimp on a jig head and live bait fish were equally effective. The flats new New Pass were the top spots. Radio Tower, Middlegrounds, and Bishop's Pt were all very productive. As has been the case, the nost productive pattern on my charters has been to start off casting jigs at first light. Either Bass Assassin Sea Shad baits and Gulp Shrimp on a 1/4 jig head worked well in six feet to ten feet of water over submerged grass. On several morning the jig bite stayed strong. On other mornings, or with young kids, a switch to live bait mid morning worked well. Pilchards and threadfin herring were small, but just large enough for bay fishing. Chumming the deep flats with live baitfish is a deadly technique in summer. Bait fish are usually plentiful and easy to catch. The smaller bait is actually advantageous. More bait fish can fit in the well and the smaller chum gets the fish excited without filling them up. Snapper and trout are attracted to the line of chum. Catching them on a hooked bait is pretty easy after that. I spent one morning trying for snook on the flats and docks in New Pass. A topwater plug fooled one snook. Live shrimp free lined under docks produced another. It was quite breezy with storms, so we called it an early morning and went in. After 27 years of guiding, I am still surprised to see new things. This week Mitch French was free lining a small pilchard out behind the boat. Something big grabbed it and dumped the spool. After a scramble to chase it down, we landed a 35" snook! That was a big SArasota snook. In normal action, the bite on the deep grass flats has been steady. Gulp Shrimp produced early then a switch to lve bait worked better later in the morning. Fresh cut bait worked well, too. Speckled trout, Spanish mackerel, bluefish, jacks, grouper, snapper, sharks, ladyfish and more were landed. Just about ecery grass flat in 6' to 10' of water held fish. This action should continue all summer. Wind, tide, and water clarity are all important issues when deciding where to fish. Recent rains helped cool the water off, however is also stains it. The floating mossy weed has definitely thinned out, which is a good thing. Whenever possible, choosing a spot where the wind and tide move in the same direction is very beneficial. 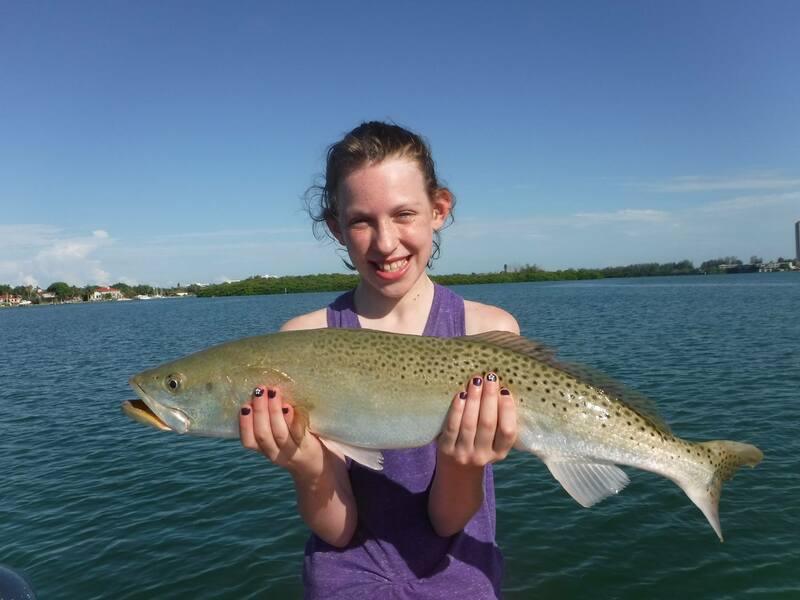 Speckled trout have been the most plentiful species caught on Sarasota fishing charters. Trout hit both jigs and live bait fish. Chumming with live bait is a fantastic technique that produces a lot of fish. Spanish mackerel will show up in the chum and feed more aggressively. Adding more chum will keep them fired up. My Sarasota fishing report would not be complete without a mention of snook and tarpon. Snook fishing has been good in Big Sarasota Pass and New Pass. There are also plenty of fish out on the beach. Outgoing tides are best for fishing the pass for Big Sarasota snook. A high, incoming tide is preffered for the beach. It has been a disappointing season for tarpon in 2018. West wind, a bit of red tide, and fishing pressure were all factors. Summer means a bunch opf families visiting Sarasota and Siesta Key and Lido Key, and for me running my fishing charters, that means families with children. The goal on these trips is action and vartiety, keeping the rods bent and the kids excited is very important. I switched over to primarily fishing with live bait as this is the best approach to achieving that goal. My Sarasota fishing report includes speckled trout, Spanish mackerel, bluefish, jack crevelle, gag grouper, mangrove snapper, ladyfish, catfish, and more. The deep grass flats near both passes were the best spots. Getting out there early was crucial, it has been VERY hot! We started at 6:30 and finished up by 10:30. Most charters produced around 50 fish. My Sarasota fishing report is fair at best as conditions have not been the best of late. For some reason, the water in Sarasota Bay remained murky and a kind of brown color. I am not sure if it was due to the persistent wind, or perhaps the rain, but the stained water makes the fishing a bit tough. Still, persistent anglers caught speckled trout to 21", snook, ladyfish, jacks, gag grouper, snapper, ladyfish, catfish, and a small cobia this week. Gulp Shrimp and Bass Assassin jigs fooled most of the fish while free lined live shrimp also accounted for fish. The flats in the middle of the bay were best, with Bishop's Pt. being the top spot. Docks in New Pass hels snook while bridges produced mangrove snapper, jacks, and a small cobia on live shrimp. I am hoping the water clears up and the baitfish show up; that will really crank up the summer fishing. Mother Nature has made fishing in Sarasota a bit challeging of late. It has been breezy with som rain and with Tropical Storm Alberto bearing down, we can expect more of the same for several days. Also, I was on vacation for a week or so, did some bass fishin in Indiana. In between the weather, clients landed speckled trout, Spanish mackerel, bluefish, ladyfish, and more on the deep grass flats using jigs and live shrimp. Rapala plugs and live hand-picked shrimp fooled snook, redfish, mangrove snapper, and jack crevelle along mangrove shorelines and under docks in Robert's Bay. Tarpon are showing up, but the wind is hindering the fishing. Fishing was good this week, with anglers catching a variety of species using several different techniques. The deep grass flats continue to be the most reliable pattern. Speckled trout were plentiful on flats in 6' to 8' of water for clients fishing lIdo Key, Radio Tower, and Stephen's Pt. Wind was an issue, forcing us to look for a little break and fish the east side of the bay and the flats behind Bird Key. Live shrimp and jigs with Gulp Shrimp and Bass Assassin baits did well. Spanish mackerel,bluefish, gag grouper, and ladyfish were also landed. Big Sarasota Pass runs between Siesta Key and Lido Key and has been providing anglers on Sarasota fishing charters with steady action. Ladyfish, mackerel, pompano, and catfish hit small chartreuse jigs and live shrimp. Drifting with the tide worked best. Docks in Robert's Bay along Siesta Key are holding redfish, snook, snapper, and sheepshead. It is a bit late in the season, but there are still sheepshead around. Live shrimp fished with a split shat was the best technique. It is encouraging to see redfish starting to show up again after being scarce the last couple of years. I fished Sunday through Friday this week, all with repeat clients, which is normal for holiday weeks. Action was VERY good for anglers on Sarasota fishing charters, both in Big Sarasota Pass and on the deep grass flats. The Middlegrounds was the top spot, yielding pompano, Spanish mackerel, speckled trout, silver trout, bluefish, flounder, ladyfish and more on Gulp and Bass Assassin baits. Tuesday morning was glassy-calm, so we took a look out in the Gulf Of Mexico and found sone Spanish mackerel using Rapala plugs near the artificial reefs and the mouth of New Pass. I fished for sheepshead and other bottom fish around structure in Big Pass four mornings, and the bite was hot on three of them. Sheepshead, mangrove snapper, Key West grunts and gag grouper kept the rods bent and customers happy! Frozen shrimp on the bottom produced the fish. If you are a fishing guide in Sarasota and it is a holiday week, that means families and kids, and this week was no exception. Clients had to deal with a bit of wind, especially on Tuesday, but the action on the deep grass flats was very good. The Middlegrounds, Stephen's Pt, and Marina Jack flats all produced good numbers of speckled trout and ladyfish, with a few bluefish, gag grouper, big sailcats, and pompano mixed in. Bass Assassin Sea Shad baits and Gulp Shrimp caught all of the fish. It is not difficult to teach a young angler to catch fish with a jig! We did a bit of bottom fishing in Big Pass and caught a few sheepshead and snapper. A trip up into Phillippi Creek on the breezy Tuesday produced jacks and small snook using Rapala X-Raps. Fishing was outstanding this week….before and after the front! I ran two trips on Monday, and the bite was on, as it usually is before a big weather change. Sheepshead, snapper, and grouper hit shrimp in Big Pass and Bass Assassin jigs and live shrimp produced speckled trout, Spanish mackerel, ladyfish, bluefish, and a shark at Bishop's Pt. and Middlegrounds. The front shut things down for several days. I am at the point in my guiding career where I really just want to fish when it is pretty nice out, and most of my clients are on board with that philosophy. I ran out to Jiggs Landing on Friday afternoon for a couple of hours, just to get out of the house. I did not expect much with the high pressure, but caught a couple of bass on a Rapala and a worm, along with seeing birds, gators, turtles, and otters. The bite resumed for clients on fishing charters on Saturday. Murky water did not deter the fish as they were in an actively feeding mood. Jigs produced a lot of trout and ladyfish at the Middlegrounds and Radio Tower. Weather was once again a factor this week as a pretty strong front moved through early in the week, impacting my Sarasota fishing report. The bite was strong on Sunday as we drifted the flats casting Bass Assassin jigs and catching a bunch of fish. Monday and Tuesday were nasty, and it was still breezy Wednesday but got better each day after that. Speckled trout, Spanish mackerel, and ladyfish hit jigs and free lined shrimp on the deeper flats. The areas north of New Pass had cleaner water and those spots were more productive., with Bishop's Pt. and Stephen's Pt. being best for me. I ran across a bucket while up on plane and saw a tripletail under it. A live shrimp cast toward it was instantly devoured! The passes and nearby docks are loaded up with sheepshead, if you want a few for dinner, fine, but please don't keep too many as they are easy to catch while schooled up to spawn. Redfish and snook hit live shrimp under docks south of Phillippi Creek. Mother Nature had an impact this week as a fairly strong front moved through mid-week. Clients on fishing charters experienced fast action on Monday and Tuesday as the front approached. Speckled trout and ladyfish were plentiful at Marina Jacks and Marker #5 and hit Bass Assassin Sea Shad baits. Sheepshead, mangrove snapper, Key West grunts, and gag grouper hit shrimp in Big Pass. Docks in Robert's Bay held snook and grouper. I got back out on Friday afternoon as the winds subsided, and expected to find the water churned up. I was pleasantly surprised to find the water fairly clear, considering. Middlegrounds and Bishop's Pt were the top spots with anglers landing pompano, speckled trout, grouper, ladyfish, a blacktip shark, and a small cobia casting Gulp Shrimp on a jig head. Fishing was good this week, though on most trips we did have to work a bit for them. I would characterize the bite as "steady" this week for clients on Sarasota fishing charters. We did a pretty even mix of drifting the flats and bottom fishing. Bass Assassin jigs and Gulp Shrimp produced decent bluefish, speckled trout to 21", and plenty of ladyfish at the Middlegrounds, Bishop's Pt., and Buttonwood. Rocks in Big Pass and docks near Bird Key and Siesta Key were quite productive, pleasing anglers with nice sheepshead, redfish, snook, mangrove snapper, flounder, and gag grouper. Live and fresh dead shrimp fished on the bottom fooled them. Strong current prohibited fishing the pass later in the week, but tides are more favorable this upcoming week. I ran a variety of diverse Sarasota fishing charters again this week. I had 4 trips in Sarasota Bay, with spin and fly anglers catching Spanish mackerel, speckled trout, bluefish, ladyfish and more. Spin anglers did well with Bass Assassin Sea Shad baits in glow/charteuse and New Penny along with Gulp! Shrimp. Fly casters fooled the same species using Clouser Minnow patterns. One day chartreuse/white worked well and on another trip a brighter red/yellow fly was more productive. Pretty much every grass flat in 6' to 10' of water held fish; Marina Jacks, Radio Tower, Middlegrounds (probably the top spot), Bishop's Pt., and Buttonwood all kept clients busy. It looks like the sheepshead have moved into the passes and bays in large numbers. A charter towards the end of the week was extremely productive! Just about every shrimp that hit the bottom was inhaled by a sheepshead, snapper, or grouper. Submerged structure in both Big Pass and New Pass are holding a lot of fish, as are docks and bridges around Bird Key, Lido Key, and Siesta Key. River fishing has slowed down, most likely due to the water temperature hitting nearly 80 degrees. A trip to the Myakka was very slow while another to the Manatee River produced a few small snook and a decent redfish. Sarasota offers visitors a wide variety of angling opportunities, and this week was a good example of that. Some guides specialize in certain techniques, and that is fine, but I like to mix it up, that keeps it exciting for me as well. This week clients caught speckled trout, Spanish mackerel, bluefish, pompano, ladyfish, and a big whiting on the deep flats throughout the area, with the Middlegrounds being the top spot for me. Fly casters did well with a heavy chartreuse/white Clouser and spin fishers used Bass Assassin and Gulp products with success. Inshore bottom fishing trips to the nearshore reefs produced some nice sheepshead along with porgies, grouper, snapper, and flounder. River fishing is winding down early as it has been unseasonably warm. A recent trip to the Myakka did not produce a lot of fish, but Bob Blaylock from Plant City, FL caught his first ever snook on a Rapala Jointed BX Minnow, a real trophy! I have a positive fishing report for Sarasota ths week! Action on the deep grass flats improved significantly this week as water temperatures hit 70 degrees by the afternoon. Speckled trout fishing was particularly good, with many fish being caught by clients casting Gulp! Shrimp on a 1/4 ounce jig head. The flats in the middle of Sarasota Bay near Stephen's Pt and Buttonwood were the best spots. Along with trout, Spanish mackerel, bluefish, pompano, grouper, and ladyfish were landed. Sheepshead were caught by anglers fishing shrimp near docks and structure in Big Pass. Snook and jack crevelle are still up in creeks and canals and are hit Rapala plugs and Gulp! jerk baits. Water temperature fluctuated between the upper 50's and low 60's this week as cold fronts continue to move through, and that is the primary factor for my weekly fishing report. Action on the deeper grass flats was slow, with just a few ladyfish and trout being landed. Bottom fishing around rocky structure and under docks with live and frozen shrimp was more productive. Big Pass and the docks along Bird Key were the best spots as clients landed sheepshead, gag grouper, and snapper, nothing very large, but steady action. The best bite for clients on fishing charters this week was the back end of creeks and canals. The water was significantly warmer and we ran into schools of aggressive jack crevelle that hit Rapala plugs with gusto. A few snook were fooled as well. One trip to the Manatee River resulted in fair action, with a few snook and jacks hooked. Here is my latest Sarasota fishing report. Several strong cold fronts have moved through since the holiday, resulting in fishing easing into normal winter patterns. The deep grass flats are often not quite as productive due to colder, stirred up water. Bottom fishing with shrimp was productive for sheepshead, snapper, and grouper; these species are less affected by the colder water temperatures. Snook and jack crevelle migrated up into area creeks, rivers and canals and clients casting jigs and plugs did well. I ran a couple of fishing charters in the Manatee River, having a very good afternoon on Thursday, prior to the front moving through. A dozen snook hit Rapala X-Raps along with several bass, redfish, and snapper. This "river" action should continue until it warms upin the spring. Many of my clients that go out on Sarasota fishing charters over holidays such as Christmas and Easter include families with children and also novice anglers. My goal on these types of trips is pretty simple; action! Any fish that bends the rod is a good fish. Drifting the deep grass flats and passes is generally the best approach and this week was no different. Warm, sunny weather and light breezes made for ideal conditions and the fish responded. Speckled trout, pompano, cbia, sharks, bluefish, gag grouper, sailcats, jacks, and a bunch of ladyfish provided fast action in Big Pass, Marina Jacks, and the Middlegrounds. All but a few of the fish were caught using Bass Assassin jigs and Gulp! Shrimp. This will be my last fishing report for 2017 and I want to thank all of my clients for a great year!